The film is written and will be directed by Abhishek Dudhaiya while T-Series’ Bhushan Kumar and Select Media Holdings LLP will be bankrolling it. Based on India-Pakistan’s war of 1971, Abhishek Dudhaiya directorial Bhuj: The Pride of India has finalised it’s cast after actor Ajay Devgn was confirmed to be its lead star. 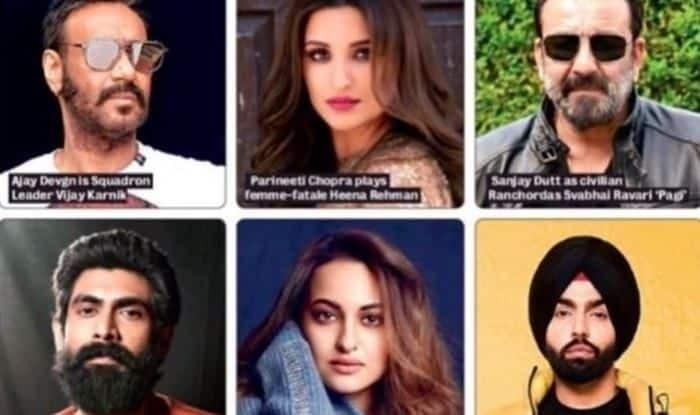 Taking to her Twitter account today, actress Parineeti Chopra shared the final star cast of the upcoming movie which showed actors Sonakshi Sinha, Sanjay Dutt, Rana Daggubati And Ammy Virk in the collage alongside Ajay and the Kesari star herself. The picture was captioned, “THE MOST SPECIAL TRUE STORY EVER! @itsBhushanKumar @TSeries @ajaydevgn @AmmyVirk @sonakshisinha @duttsanjay @RanaDaggubati” (sic). According to a report by Pinkvilla, Sonakshi will be playing the lead opposite Ajay who will essay the role of real-life hero, Squadron Leader Vijay Karnik, in the film. Karnik is famous and celebrated for taking the help of local women in Gujarat’s Bhuj in reconstructing the destroyed Indian Air Force airstrip during the war. The moment is remembered as India’s Pearl Harbour moment and is considered as one of the bravest and smartest acts shown by an Indian in the time of war. Ajay Devgn in #BhujThePrideOfIndia… Will essay the role of Squadron Leader Vijay Karnik, in charge of Bhuj airport during the 1971 Indo-Pak war… Directed by Abhishek Dudhaiya… Produced by Ginny Khanuja, Vajir Singh, Bhushan Kumar, Krishan Kumar and Abhishek Dudhaiya. The film is bankrolled by T-Series’ Bhushan Kumar and Select Media Holdings LLP.